As mentioned above (Sect. 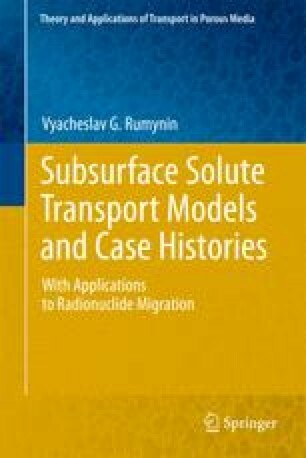 19.1.2), changes in the physicochemical conditions in the system over space and time, which take place in unsteady-state migration flows, reduce the potential of the above-considered sorption isotherm-based models with time-invariant coefficients, in particular, models describing colloid-facilitated transport. Their empirical nature does not allow them to be applied outside of the specific parameters of the contaminated site. Therefore, thermodynamics-based approach, describing sorption as a series of specific reactions between dissolved ions and surface sites, can be more productive for analyzing solute transport under field conditions.